Marilyn Shevin-Coetzee and Frans Coetzee have taught at Yale and George Washington Universities and have been the recipients of fellowships from the American Council of Learned Societies, American Philosophical Society, Alexander von Humboldt, Fulbright, and Mellon Foundations, Institute for Advanced Study (Princeton), and the National Endowment for the Humanities. 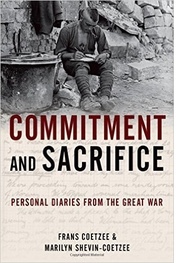 They are the authors of seven books, including Commitment and Sacrifice: Personal Diaries from the Great World War (August 2015). "Liberty Memorial 2008" by User:Charvex - Own work (Photo by author). Licensed under Public Domain via Commons. Is World War I America’s forgotten war? Unlike the other three great twentieth-century conflicts – World War II, the Korean War, and the Vietnam War - it is the only one lacking an official national memorial on Washington D.C.’s National Mall. Prompted by the upcoming centenary of the war’s end to be celebrated in 2018, and by the poignant fact that no American veterans of the conflict could be on hand to mark that event (Frank Buckles, the last survivor, died in 2011 at the age of 110), renewed efforts over the past few years have sought to focus public attention on the importance of properly commemorating America’s involvement in World War I. It has been an uphill struggle. There are three major reasons why that involvement has been apt to be forgotten. First, instead of entering the war unified and resolute, the country itself had been deeply divided over intervention. The hostilities were a continent – and an ocean – away, American interests did not appear to be directly threatened, and President Wilson himself had campaigned for reelection as the man who had kept the country out of the war. These arguments for neutrality were reinforced by fears over domestic ethnic divisions. As a land of immigrants the United States was home to significant numbers of people with cultural, economic, and sentimental ties to the Central Powers whose loyalty might be suspect. Second, because America entered the war ‘late’ (in April 1917, more than two-and-a-half years after it began) and its soldiers only fought for some six months on European soil before the November 1918 armistice, it might be thought a very junior partner in the war effort. Should a lesser role really be commemorated? Finally, the First World War was overshadowed by a second, even more destructive conflict. The sacrifices of 1914-1918 had decimated a generation but they had not made the world safe for democracy and had not curbed German aggression. Had they achieved anything permanent that was worth noting? Immediately after hostilities ended, it is true that the war was anything but forgotten. Armistice Day (now Veterans’ Day) marked that end, the American Legion enrolled veterans, and the American Battle Monuments Commission oversaw military cemeteries in Europe where soldiers had fallen. Nonetheless, remembrance was often focused on an intimate, local level; many families sought the return of their war dead for reburial in their communities and ubiquitous Doughboy statues (mass-produced copies of an original sculpted by E.M. Viquesney) dotted urban public spaces. 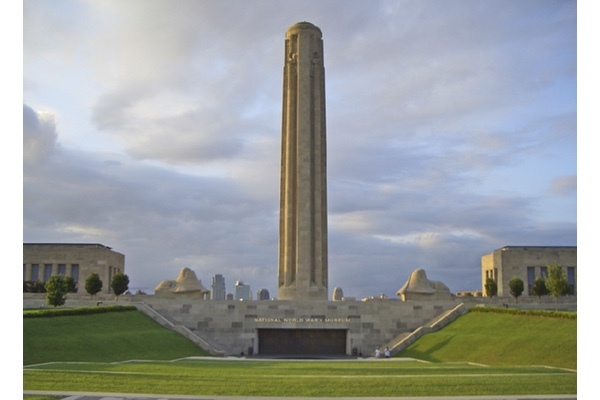 Local subscribers in Kansas City, for example, raised the funds to dedicate a Liberty Tower in 1921 (completed five years later), but their success also underscored the fact that the country still lacked a central, national site for commemoration. The Tomb of the Unknown Soldier in Arlington National Cemetery provided something of an alternative, but without conveying what the war had been about. Eventually commemorative ceremonies moved on to more recent wars, while the old memorials fell victim to neglect and disrepair. Kansas City’s Liberty Tower closed in 1994 as the nation celebrated its ‘greatest [WWII] generation’ and the fiftieth anniversary of the D-Day landings in Normandy. A decade later, in an effort to ensure that the wartime service of that generation would not be forgotten, a National World War II Memorial was dedicated on Washington D.C.’s National Mall. The stark contrast with World War I could hardly be more obvious, and the successful mobilization of public opinion and political will in favor of a national memorial to the Second World War was an important spur to renewed efforts to secure similar recognition for the First. Finding an appropriate concrete expression of the country’s World War I experience was not, however, a matter of recovering memories long-forgotten but readily accepted and easily recalled with sufficient effort. It could not be compared to excavating an intact stratum of history simply submerged by a century of indifference. Instead, attempts to locate a national memorial were inextricably intertwined with political wrangling and contemporary concerns. After the Liberty Tower was renovated in 1998 and augmented with a museum, Missouri’s congressional delegation pushed for it to be designated as the national memorial, not any proposed site in Washington, D.C. Proponents of a memorial in the nation’s capital, preferably with a visible presence on the National Mall, hoped either to expand an existing District of Columbia War Memorial, which offered a suitable location, or demolish it in favor of a redesigned edifice. These plans ran afoul of the controversy over D.C. statehood and were denounced by prominent local leaders (including delegate Eleanor Holmes Norton) as improper meddling in the District’s affairs. The fact that the names of some 23,000 District residents who had served were recorded in the memorial and could be treated so cavalierly only deepened the controversy. A third possibility was to redevelop Pershing Park, a site dedicated to General John Pershing, who had commanded the American Expeditionary Force. Critics complained that it was not on the National Mall, but supporters countered that given the National Park Service’s opposition to new construction on an already congested Mall and Pershing Park’s proximity (on Pennsylvania Avenue) to major museums and the White House, it was a reasonable alternative. Although designed by eminent architect Paul Friedberg in the 1970s, the 1.8-acre Pershing Park was widely considered somewhat isolated and run down and generally lacking the scale and gravity appropriate in a memorial to military service and sacrifice. It was in fact this site that Congress authorized in 2012-2014 compromise legislation, with a World War I Centennial Commission being designated to oversee a competition for proposals to redesign Pershing Park as a national commemorative space. Finally, in May 2015, the Centennial Commission solicited submissions for its design competition. Three months later it announced five finalists from among 350 applicants, with the winning design to be chosen from the five by January 2016. The designs differ widely: one features an imposing victory tower harkening back to the monumental architecture of a century ago, while another embeds photographs in the ground about six bronze statues. Only one, Joseph Weishaar’s “The Weight of Sacrifice,” evokes a sense of moving below ground level as in the trenches of the western front. The selection jury intentionally chose a range of styles, but the lack of consensus over how to commemorate the war is readily apparent. A century later, the First World War is no longer forgotten, but it remains not entirely clear how it is to be remembered.